NEW YORK (CNS) — True military adventures don’t come any more rousing than “12 Strong” (Warner Bros.), the story of a tiny Special Forces unit that won a significant early victory against both the Taliban and al-Qaida in the weeks after 9/11. Based on Doug Stanton’s book “Horse Soldiers,” it’s the story of Operational Detachment Alpha 595 of the Green Berets, which embedded with Northern Alliance militias, led by Afghan warlords, to drive both Taliban and al-Qaida fighters from a swath of mountainous northern Afghanistan. The mission was classified, and not disclosed to the public until years later. The Americans were sent in to call in bombing runs — in this film, only the mighty B-52 bombers appear — on Taliban positions. What made it unique was the American military sometimes fighting as horse-mounted cavalry, something not done since before World War I. It was the only way to navigate the rugged terrain with the necessary speed and nimbleness. Director Nicolai Fuglsig, working from a script by Ted Tally and Peter Craig, avoids what could have become jingoistic moments and barely refers to Islam. This is not portrayed as a religious war. America was attacked, these soldiers went about their business to prepare a military response, and they’re well aware that Afghanistan has been “the graveyard of empires” for centuries. Their occasional differences with the warlords are shown as mostly having to do with warfighting strategies, not religious beliefs. They’re given just three weeks to accomplish the mission. There are moral examples shown as well. Green Beret Capt. 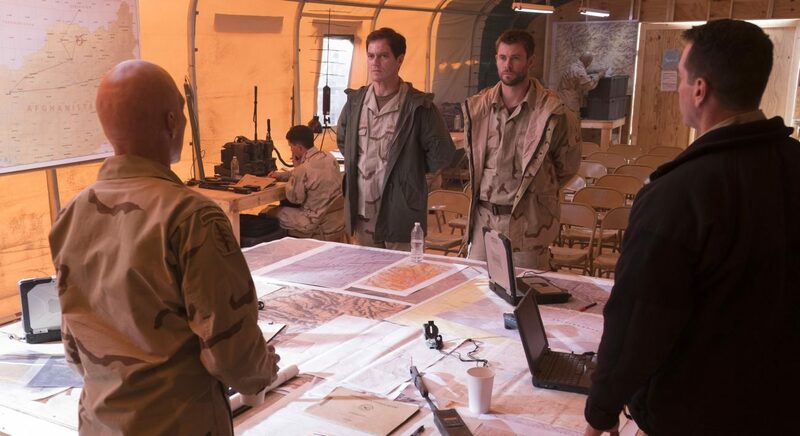 Mitch Nelson (Chris Hemsworth) keeps repeating, “The only way home is winning.” And, learning that Nelson, who leads just 11 men, is the only one in the unit who has not faced combat before, Afghan Gen. Abdul Rahid Dostum (Navid Negahban) reminds him that the only way to win is to lose all fear of dying. Only a couple of the Green Berets have had much experience riding horses, but after some initially awkward moments, they adapt well. The Taliban fighters are mechanized with old equipment, but are shown as generally inept in combat. The story keeps a tight focus on Nelson, Chief Warrant Officer Hal Spencer (Michael Shannon) and Sgt. Sam Diller (Michael Pena). All the elements of a classic war film are here, including supportive spouses back home in Fort Campbell, Kentucky, combat planning from caves, casual banter under the most stressful circumstances, the Americans treating Afghan children with candy, the occasional horseback charge, and a particularly ugly scene in which a Taliban warlord executes a teacher, in front of three young girls, for the “crime” of educating them. This is emotional manipulation, of course, but in this story, the demarcation between good guys and bad guys is very clear. So also is American valor. The film doesn’t demand that audiences cheer, but instead finds understated ways to let viewers realize that these events actually occurred. The film contains intense, lengthy and realistic combat violence and gore, a scene of an execution of a teacher in front of three young girls, and frequent rough language and profanities. The Catholic News Service classification is A-III — adults. The Motion Picture Association of America rating is R — restricted. Under 17 requires accompanying parent or adult guardian.